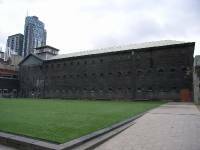 Old Melbourne Gaol. This is where Ned Kelly lived his final days before he was hanged on the 11th November 1880. In total 136 Hangings took place in the Gaol before its closure in 1924. It was quite spooky to walk round and the cells were just tiny. I could walk in them as they made me so claustraphobic. The prisoners in the Gaol were not to have any contact with any of the fellow prisoners so when they were moved from their cells they had to wear a mask so they could not be identified. It was very interesting to see it all even if it was a bit scary!